In mplayer, you can change the playback speed with [ or ], but that probably changes the pitch as well (naturally). Can be amusing the first time, but not after you realise that it is actually possible to do something sophisticated to avoid this. (Wikipedia calls it Audio timescale-pitch modification) Many other media players (including VLC and even Windows Media Player(?)) can do this automatically; here’s how to do it in mplayer. Seems even the latter might require installing the ladspa plugins. 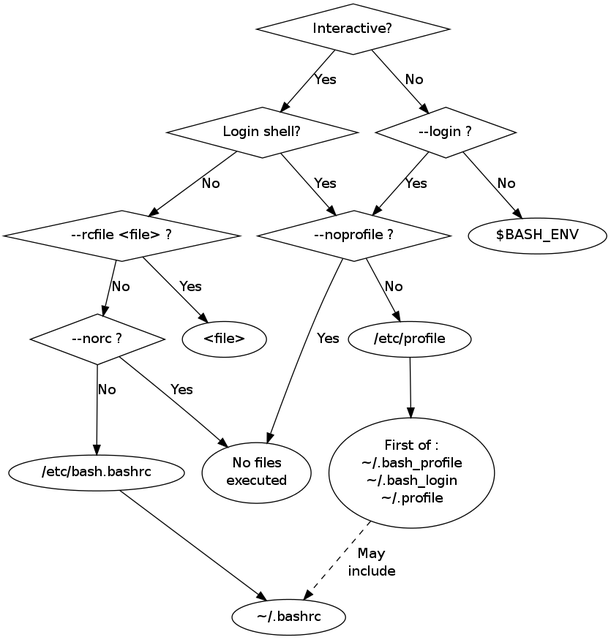 If you have ever put something in a file like .bashrc and had it not work, or are confused by why there are so many different files — .bashrc, .bash_profile, .bash_login, .profile etc. — and what they do, this is for you. The issue is that Bash sources from a different file based on what kind of shell it thinks it is in. For an “interactive non-login shell”, it reads .bashrc, but for an “interactive login shell” it reads from the first of .bash_profile, .bash_login and .profile (only). There is no sane reason why this should be so; it’s just historical. Follows in more detail. For Bash, they work as follows. Read down the appropriate column. Executes A, then B, then C, etc. The B1, B2, B3 means it executes only the first of those files found. * they logged in remotely, such as through ssh. Found it thanks to this blog. Goodbye Adium: Pidgin on Mac OS X… with native GTK! 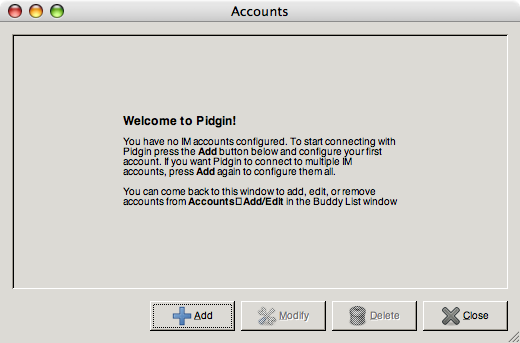 So you’re on Mac OS X, and want to use Pidgin on it. First: Why not use Adium? Adium is a Free multi-protocol IM client for Mac OS X that uses libpurple, the IM library that was developed as part of Pidgin. It has several popular features such as message styles, and uses the Cocoa API native to Mac OS X, and all round looks pretty. Being a native Cocoa application, it is more well-integrated with the Mac desktop than a GTK-using application like Pidgin can ever be. Install Pidgin to run inside X11. Any default distribution of Pidgin should build fine on this, as long as you have all the dependencies installed. However, using an X11 app on OS X is really like entering another universe entirely… it’s like having two entirely disjoint OSes that just happen to run simultaneously. It is cumbersome, and I would not recommend it unless you are already doing much of your work inside X11 for some reason. Install Pidgin to run on the Mac desktop directly (without X11), using native GTK+ for Mac OS X and some minor modifications to Pidgin. This is very simple to do and requires only one step, described below. If I select a feed URL (or “live bookmark” as Firefox likes to call it), and choose to “subscribe to this feed using: Google”, I am taken to a Google page that always shows two options, “Add to Google homepage” and “Add to Google Reader”. Is there a way of directly going to Google Reader each time? 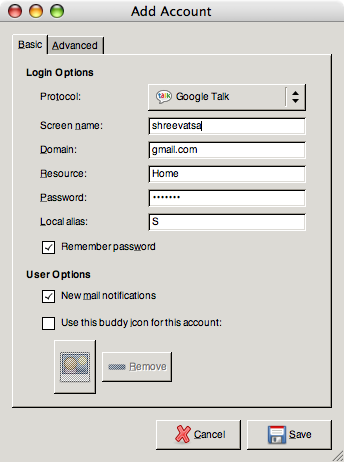 Yes: Auto add to Google Reader, a Greasemonkey script. It probably works; but I’m using an alpha release of Firefox 3 (“Gran Paradiso”), and Greasemonkey doesn’t work for me so I can’t be sure. set realname = "Your Real Name"
Make sure your ~/.muttrc isn’t world-readable; it contains your password. (Alternatively, you can leave them out and mutt will prompt you for the password each time.) Also, if you copy-paste from the above, make sure that you have only “normal” quotes, not “smart quotes” which WordPress might have inserted here into this post. Things work perfectly as you would expect them. One thing to note is that the full headers will still contain the hostname of the computer you send messages from. I have not figured a way of hiding this, and perhaps it shouldn’t be possible. If for some reason you want to use POP, read on. And tell me why you would want to use POP. The rest of the post is an old version, which i had written before Gmail supported IMAP. There is a guide here, which is the first Google result on searching for the keywords Gmail, mutt and Ubuntu in any order, but I would advise against it: it does too much unnecessary stuff using too many unnecessary programs (okay if you don’t care), and involves putting your username and password in a world-readable file (not okay). Everything else seems to be optional. /usr/sbin/ssmtp -au "gmail-address" -ap "password" $@ and put it somewhere in your path (~/bin/gmailout, say) and make it executable (chmod u+x ~/bin/gmailout, I mean) and make sure only you can read it! (chmod og-r ~/bin/gmailout). You can start mutt, and hit “G” (uppercase G) whenever you want to fetch mail. Can also put exec fetch-mail in ~/.muttrc to have it happen whenever you start mutt, but I find that irritating. Apart from that, it works fine! MusicTracker is a plugin for Pidgin (previously known as Gaim) which displays the music track currently playing in the status message of various accounts such as AIM, Yahoo, MSN, Gtalk (Jabber), etc., i.e. any protocol Pidgin supports custom statuses on. Support for a wide range of audio players on both Windows and Linux platforms is planned. Currently supported players: Amarok, Rhythmbox, Audacious, XMMS, MPC/MPD, Exaile, Banshee, Quod Libet on Linux. Winamp, Windows Media Player (9+), iTunes, Foobar2000 (incomplete support) on Windows. Is apparently the best option, but also a very frequent cause of crashes. Current Track plugin will update your Gaim/Pidgin user info, available message or away message, and buddy icon from iTunes, Winamp, RealPlayer, WMP, Musicmatch, MediaMonkey, XMPlay, Yahoo! & Foobar2000 in Windows and XMMS, Rhythmbox, & Amarok in Linux. Has been known to crash Pidgin. I’ve heard it has a feature where you can type “/currentrack” in a conversation window to send your current track, which is pretty cool. Not very useful if it crashes Pidgin though, is it? This plugin will replace %now-playing in your status message with metadata from the currently playing song in a MPRIS compatible media player (currently including BMPx 0.4, VLC SVN trunk, Audacious 1.4.0 devel), if any. It appears that MPRIS is an informal standard for music players to support a common interface. In an ideal world, all music players would support this standard, and in the real world, this may or may not happen. Amarok is also probably supported already. MusicInfo is a plugin for the Pidgin instant messaging client. It lets you display the music that you are listening to in your away message, available message, and profile. For Winamp, and some players that have a Winamp emulation mode. AutoProfile is an extension to Gaim that allows users to create customized away messages and profiles using dynamic “components” that automatically update on a regular basis. Generated text can include song names from XMMS/Winamp/iTunes, fortune quotes, computer uptime, the contents of a Web page or a text file, the output of a program, and timestamps. Is for Gaim 2.0.0beta3, not updated for Pidgin as of 2007-11-11 (last updated 2006-04-05, so don’t hold your breath). The Pidgin-Rhythmbox plugin will automatically update your Pidgin user info and status message with the currently playing music in Rhythmbox. If the artist and title are known, it will also attempt to create a link to the song’s lyrics by using Google’s “I’m Feeling Lucky” feature. Pidgin-Rhythmbox will replace %rb in your user info and status message with the song information. Write your own script. You can set status from the command line with purple-remote "setstatus?status=whatever&message=whatever". For example, purple-remote "setstatus?status=available&message=" will clear the status message. You can also use D-Bus. There is a very good introduction to D-Bus here, and Ars Technica has some examples of using Pidgin’s D-Bus interface. This is essentially what many of the above plugins do (those that don’t crash your Pidgin). Assuming that you have a way of getting the song (or whatever string you want in your status message) somehow (through D-Bus, maybe) in a script, this is certainly the most flexible option, as you can do exactly what you want with the status message (append to it v/s replace it, add the current time, artist but not title, whatever). You can also look at D-Bus Howto for Pidgin (who wrote that? :), but the harder part is getting the current song from your music player. Note: While MusicTracker seems to be the plugin that the maximum number of people have been successful in using, it appears that it sometimes crashes Pidgin as well (especially on non-ASCII characters in the title/artist). Evidently, no plugin is perfect (except one that you write yourself :P) and you should take a moment to consider whether you really need a plugin of this sort. I know it seems cool and several IM clients provide a feature like this, but is it really necessary? Do your friends really care what music you’re listening to?